Vegetarian and vegan meals and meal centres* are booming in Germany, as the rise of flexitarianism — a plant-based diet with the occasional inclusion of meat — offers new opportunities for manufacturers to experiment with meat-free product concepts. 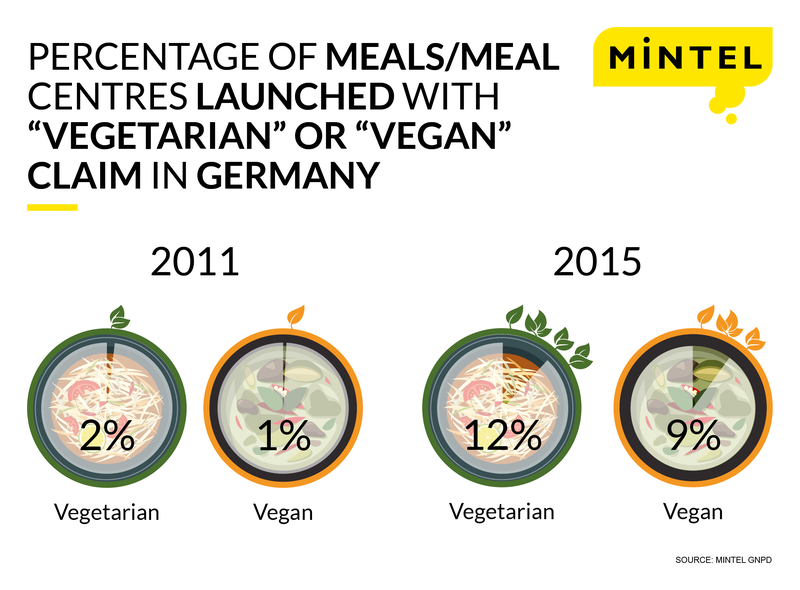 New research from Mintel reveals the number of meals and meal centres with vegetarian labels increased more than seven-fold (633%) in Germany between 2011 and 2015, while the number of vegan-labelled meals and meal centres has grown more than twenty-fold since 2011. The growing number of vegetarian and vegan meals and meal centres is the result of vegetarian claims appearing on 12% of all meal and meal centre launches in Germany in 2015, up from only 2% in 2011. Similarly, vegan claims in this category have also increased sharply, from just 1% of all meal and meal centres launches in 2011 to 9% in 2015. What’s more, meal and meal centres containing plant-based proteins, such as soy or wheat, show particularly strong growth. Prior to 2014, the share of launches with plant proteins appeared stagnant, whereas innovation activity has increased dramatically over the last two years. In fact, the share of meal and meal centres containing plant-based protein climbed from 9% in 2013 to 23% in 2015, according to Mintel’s Global New Products Database (GNPD). Mintel’s consumer research from 2015 confirms this trend, revealing growing interest in meat-free eating and flexitarianism in Germany. Whereas only 7% of German adults claim to follow a vegetarian diet, more than a third (33%) say they are actively reducing their consumption of red meat, while 19% say they are incorporating more vegetarian foods into their diet compared to a year ago. Furthermore, it seems like health-conscious Millennials and their evolving attitudes toward nutrition are the biggest forces behind the rise of meat alternatives in Germany. Compared to consumers overall, twice as many Germans aged 16-24 define themselves as vegetarians (16%); moreover, almost one in three (31%) say they are incorporating more vegetarian foods into their diets compared to a year ago. When it comes to the reasons behind the choice to eat meat alternatives, ethical and environmental concerns seem to be among the main drivers. Indeed, Mintel research reveals that three in 10 (30%) Germans who eat meat alternatives say that ethical concerns such as animal welfare are a reason why they choose alternatives, rising to almost two in five (39%) 16-24 year olds. Meanwhile, more than one in five (22%) name environmental concerns as the reason they look to non-meat alternatives. “Driven by increasing concerns about health, the environment and ethics, plant-based diets have never been as popular in Germany as they are today. Not only is there a steady rise in the numbers of committed vegetarians and vegans, but also a growing number of consumers who are actively reducing their meat consumption in favour of so-called flexitarian diets.” Katya adds. However, Mintel research indicates that the meals and meal centres category still has a long way to go when it comes to health credentials, as less than three in 10 (27%) German 16-24 year olds agree that prepared meals are a healthy meal option, while around half (51%) say prepared meals contain too many highly processed ingredients. Yet, it seems that young consumers are hungry to see healthier options in the category as more than three out of five (63%) German consumers aged 16-24 say it is important to them that prepared meals are made from healthy ingredients such as whole-grain rice and vegetables, while around half (51%) agree it’s worth paying more for prepared meals with certified organic products. “Given the strong interest in meat alternatives among younger German consumers, promoting attributes such as healthy ingredients, high protein and whole grain content, as well as the ethical quality aspects of meat substitute-based ready meals could make them even more appealing to the target Millennial generation.” Katya concluded. Press review copies of the research, more information on the sample sizes of the surveys and interviews with Senior Food & Drink Analyst Katya Witham are available on request from the press office.